There are several parameters to consider when choosing a video hosting platform for your video-based website - from storage limit to integration complexity. Whether you are building an online course website, a membership website with restricted video content, an eLearning platform, or you create video art, you know how important it is to protect your video material and prevent its unauthorized sharing. First of all, hosting videos is highly demanding in terms of hardware and infrastructure. So, if you are not technically advanced or ready to invest in hardware resources, you definitely do not want to host your videos by yourself. To protect your work, you need a video hosting platform that offers various access restrictions. Different platforms offer different kinds of protection but they may not suit your specific needs or they might be too expensive for your project phase or too technically demanding and complicated to use. Here, I will analyze four most popular solutions and compare them by the most important parameters. I will consider YouTube, Vimeo Pro, Amazon S3 and Wistia. YouTube fails to offer domain-level privacy and provides only simple video privacy settings – Private, Unlisted and Public but we made it possible to embed private YouTube videos on your website and lock them for a specific domain. Let us see why these parameters are important to you. Storage limit is defined by how many videos you can store or by the amount of data your videos may take up on a platform. If your business model implies a large number of short videos, then you definitely should opt for a platform that defines a limit in terms of data amount. On the other hand, if you need to host a smaller number of longer videos, your choice should be a limit in terms of videos quantity. Bandwidth is the data traffic between a video hosting platform and a viewer's browser that occurs while playing the video content. Some video hosting platforms limit this data traffic and charge you for exceeding it. If you plan to serve HD movies and expect a large audience, then you definitely want to consider a hosting platform with unlimited bandwidth. Some video hosting platforms allow you to customize the video player to some extent, to change colors and commands or even brand it with your logo. On the other hand, others allow you to use a third party video player that could be fully customized. For already established businesses, or if your budget allows it, you can choose to pay for this option that will certainly make a better impact on your visitors. It is very useful to know what videos your visitors watch the most and when. That information may help you to create a content that your visitors want the most. I would consider this as one of the most important features. Various privacy settings enable you to limit access to your videos per user base, domain level or some other parameters. This is of crucial importance if you want to protect your video content from being shared. For the purpose of preventing unauthorized video sharing, the most usable feature is domain-level privacy. With this kind of privacy settings, you can define on what domains (websites) your videos may be embedded. This will disable the embedding of your videos on websites other than the ones you specified. When it comes to integration or embedding, things may get very tricky. Some platforms, like YouTube, offer very simple ways to embed videos on your website pages but others, like Amazon S3, may require a certain level of technical skills to do that. Complex systems offer more options but require a greater technical knowledge. On the other hand, more user-friendly platforms can get you going much faster but do not offer so many fine tuning options. So, if you do not want to mess with complex setup process and integration, you should choose YouTube, Vimeo or Wistia. But if you would like to keep everything under control and be able to fine tune your video integration settings, your platform of choice is Amazon S3. 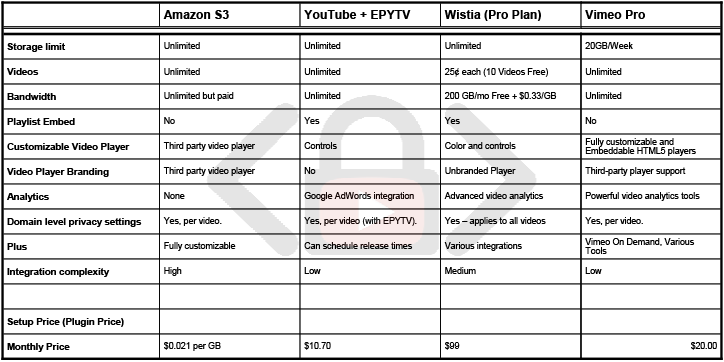 The following table shows numbered features for four most popular video hosting platforms. Embed Private YouTube Video - Copyright © 2019 All Rights Reserved.